The Monaco Grand Prix is one of the world's greatest sporting experiences. The Principality offers glamour, colour and atmosphere while the circuit offers the spectator the chance to get as close to a racing F1 car as is humanly possible. It is a unique experience and the most popular of all the F1 venues. The mix of spectators is electric - European royalty, international film stars, heads of industry, leading sponsors all mixing with avid, knowledgeable fans. Monaco is perhaps the finest street circuit in the world. It is a tight, twisting affair in and around the famous streets of Monte Carlo. The proximity of the barriers makes it feel like the fastest track in the business; the noise and vibration from the circuit is unbelievable. The Monte Carlo Bay Hotel and Resort opened in October 2005 and is located just minutes from the city's casino square. This breathtaking peninsula is like a natural Eden reinvented, a garden floating on water. Charm and relaxed elegance characterize the hotel, situated at the waterfront of Monte Carlo Bay. Over 75 percent of the luxuriously appointed guest rooms and suites feature a private balcony and sea view. These spacious rooms offer privacy and comfort, space and light decorated with pale marble and exotic woods. The Monte Carlo Bay Hotel and Resort offers facilities and services for every type of guest. From a fully-equipped business centre to indoor and outdoor swimming pools, a sandy-bottomed lagoon, casino and a myriad of dining opportunities and entertainment, the Monte Carlo Bay Hotel offers the ultimate stay for the Monaco Grand Prix. The Monte Carlo Grand is one of the most famous of Monte Carlo hotels. This luxury 4 star deluxe sea-front hotel is located on the circuit above the famous tunnel section. The hotel is a prestigious base for your Grand Prix weekend. It has many guest amenities including a number of restaurants and bars, a tea room, brasserie, 24-hour room service and an American Casino and health spa. There is also a roof top swimming pool. Uniquely the hotel offers access to the 7th floor terrace overlooking the famous Fairmont Hairpin. Following a vast refurbishment programme, the new Hotel Metropole is a superb example of elegant and stylish accommodation. 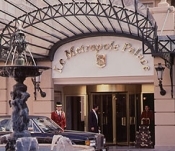 The 5 star Metropole is wonderfully located just steps away from Casino Square and offers 149 guest rooms. The hotel also offers the Joel Robuchon restaurant par excellence, a bar, swimming pool and spa facilities. Race viewing is possible from the restaurant. The 4 star Hotel Ambassadeur is the most recently 4-star hotel built in Juan les Pins; it offers 225 well-equipped bedrooms, including 19 suites. All bedrooms are provencal colors decorated, and have all a terrasse or balcony. The hotel has its' own private sandy beach and there is a lagoon style outdoor pool, three restaurants and a bar. Enjoy the best of both worlds; watch the race in Monte Carlo and enjoy the best of Cote d'Azur. Radisson SAS Hotel Nice located on the famous Promenade des Anglais, the Radisson SAS hotel has long been a modern landmark on the French Riviera. Now fully renovated, the hotel features 331 rooms, excellent meeting facilities, great bars and restaurants, and and a roof top pool open all year. New fitness centre with sauna, hammam and massages on request allowes the guest to relax. Le Meridien Nice is a superior 4 star hotel and has a superb location on the Promenade des Anglais, directly overlooking the sea and yet in the very heart of the city. There are 318 well appointed guest rooms with air-conditioning, soundproofing, satellite television and mini bar. There is also a bar and main restaurant with sea views and an outdoor roof-top pool alfresco roof-top restaurant. The price panel rates are for Classic rooms; also included in the price is a F1 party on May 23 from 19:30 - the evening comprises a cocktail reception and buffet together with entertainment, DJs, slot racing, wine casino and numerous prizes. A modern, superior 2 star hotel located next to the main Nice railway station for easy train access to Monte Carlo; the journey takes approximately 19 minutes. All 199 rooms have en-suite facilities, air conditioning, sounproofing and satellite television. The hotel also has a large bar and a well priced restaurant. There is a small outdoor pool and covered car parking. The Promenade des Anglais and access to the main restaurant and shops is approximately a 15 minute walk. Other hotels available on request. We can organise any manner of group airport and / or circuit transfers. This may be by Mercedes with uniformed driver, executive coache, helicopter, boat or even VIP branded minibus. We recognise that guests may wish the flexibility of travelling from any airport on a particular day and we are happy to advise on this matter in addition to offering tailor-made options. We also organise private jets for the Grand Prix weekend or simply for the day. Please call reservations. We can provide an array of grandstand tickets. All stands are numbered reserved seating. None of the grandstands are covered. Rocher (general entry) ticket is a standing only with a view of the giant screen across the port. A Thursday ticket in the same category will be offered (on request) to those booking a Sat & Sun ticket together. Any spectator in possesssion of a grandstand ticket (Saturday or Sunday) will be able to VISIT THE PITS FREE OF CHARGE on Friday afternoon, from 2.30 pm to 6 pm. Admission on Friday is free. However, not all the stands will be open. Screens are visible from a wide selection of grandstands. From the top rows of L & T, you can see the pits.